Located in the city of Toronto is Chinatown. 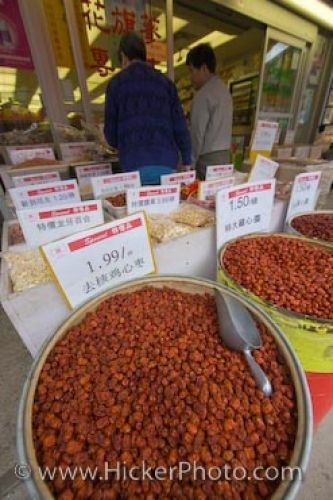 A store in Chinatown displays authentic Chinese food, herbs and spices. People walk among the displays of the store. Each large barrel and bag have prices above them. Authentic Chinese foods / herbs / spices for sale in stores in Chinatown in the city of Toronto, Ontario, Canada. Authentic Chinese food with herbs and spices for sale in Chinatown markets, Toronto.